In our house, playing board games is a big part of how we spend time together as a family. My husband and I and our two kids declare family game night at least twice a week. We may play a quick game of Uno or Zigity (another cool card game) to unwind one evening during the school week and save a longer game of Monopoly or Life for a Sunday. Currently, our game of choice is poker, but we also like Clue, Pictionary Jr., Scrabble, and a similar word game called Nab It. The four of us have shared plenty of laughs and yes, even a few tears while playing games at the kitchen table. I enjoy playing not only because of the time spent together, but also because of everything our children learn through game play. Playing poker, for example, teaches the kids how to think, concentrate, and strategize, how to count, and how to win or lose as good sports. Breaking out Family Trivial Pursuit and partnering up enables the kids to learn how to work as a team. In today’s world of computers, cell phones, electronic tablets, video games, and the need for instant gratification through tech, combined with busier-than-ever schedules that send family members off in different directions, it seems board-game play might have fallen by the wayside. 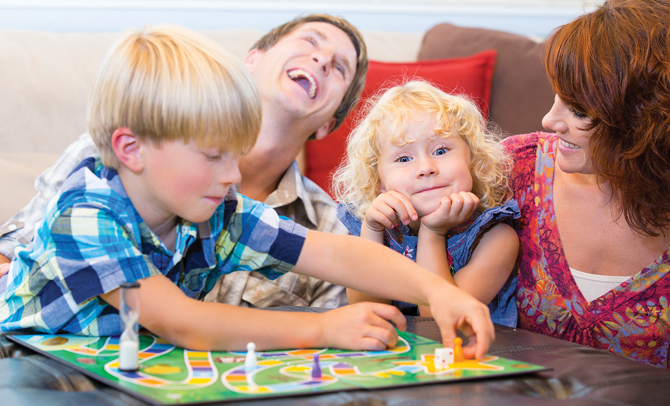 But, as it turns out, holding regular family game nights is beneficial to children and families in many ways. Valarie Krol of Midlothian knows all too well how hectic schedules can get for herself, her husband, and her four children throughout the week, so she attempts to make every Saturday a family night, which often includes playing games. Her children enjoy Life, Monopoly, and Uno. Krol has two girls, ages thirteen and ten, and two boys, ages three years and eighteen months, so the family takes turns playing a game that is age-appropriate for each of the kids. 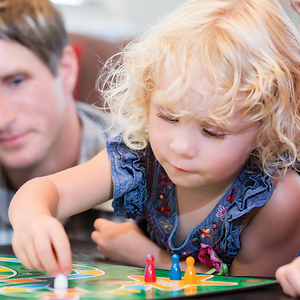 Beyond family bonding, children gain skills through board-game play that help them with other aspects of their lives. Shannon Saweikis, also of Midlothian, likes to play Battleship with her nine-year-old son or Chutes and Ladders with her four-year-old daughter. Saweikis and her daughter play games multiple times a week. Some of her family’s favorite games are Sorry, Monopoly, Clue, and Qwirkle. Taylor’s witnessed how game play is helpful to her two children, now eleven and nine. Research shows that playing cards or a game of chess can also make for better students in school. According to one study, children gain executive function skills through game play that lead to successful learning in the classroom. 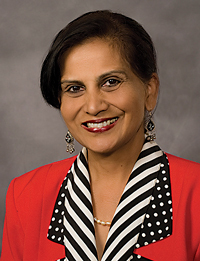 Playing board games, says Dr. Sood, aids children with the development of critical thinking skills, analytical skills, and other skills they will need to use while they are in school. Keeping score and counting spaces assists with math skills, while games like Scrabble, Bananagrams, or Word Yahtzee aid with spelling and reading. Children also learn better communication and social skills, as well as problem-solving skills through game play. Dr. Sood suggests games such as Scrabble and Othello for older kids, Chutes and Ladders for the younger set, and Boggle, Hangman, and Connect Four for those in between as classic games to assist with the development of such skills. Area elementary schools and local libraries offer game nights periodically to provide opportunity for family and friends to gather for some fun while introducing new games. Public libraries in Chesterfield County hold chess tournaments and host Wii game nights while libraries in Henrico County hold game events for families and teens. At Twin Hickory Library in the far West End, family fun nights are held monthly with as many as eighty people turning out to partake in various programs and activities, including Bingo, Hangman, Scrabble tournaments and challenges based on the TV game show Minute to Win It. “Perhaps the most important part of these programs is the opportunity for families to play together, especially those with working parents,” says Gay Lynn Van Vleck, children’s services supervisor for Twin Hickory Library. “We often are tickled by the fact that the parents have as much fun as their children.” Van Vleck says the library team tries to incorporate learning into all of the games. In Bingo, they’ll use words and phrases in the blocks and spell words as the category is called. The library associate says socialization is a big part of the success of family game night. “The children learn team skills of listening and how to integrate several ideas to make a plan work. A few families have also mentioned that they make new friends at these programs, so the events are especially valuable to folks who are new to the area,” she says. While video games tend to have a bad rep, played in moderation, these games can be beneficial to children. Occasionally, my husband and I will dig out our old-school Atari and share games with our children from our own childhoods. Playing Pac-Man, Frogger, Kaboom, or Super Breakout allows us to bond with our children and allows them to experience our nostalgia. Wii Sports or Just Dance provides an opportunity to have fun while getting physical on days when exercising outside isn’t an option. Meanwhile, our daughter learns to spell and read through electronic Wheel of Fortune. Video games can also help with hand eye coordination and strategy. No matter what games you decide to play as a family, it’s important to make it as much a regular part of your family life as possible. Start with something simple and non-competitive and it eventually may become a regular activity. Valarie Krol hopes family game night will continue to be a staple in her house. Previous articleAce in the Hills!